The MIT Lincoln Lab and the Boston Redevelopment Authority uncovered 22 potential microgrid sites in Boston that could save $1 billion. Jacob Solomon of MIT Lincoln Lab describes how they did it. In 2012, New York City sustained $19 billion in damages attributed to Hurricane Sandy. Much of this pricetag went to repairs to the city’s energy infrastructure, but loss of power resulting from the damages to the energy distribution system led to consequent costs, such as lost business and productivity, increased demand for emergency social services, and ruined food and pharmaceuticals. Because the areas that were most successful in retaining power were those supported by energy microgrids, many states have begun to look at microgrid strategies to improve the resilience of their energy distribution systems to large-scale disasters. Microgrids, which are localized power grids with the ability to disconnect from the larger energy grid, offer improved resilience to disruptions and have the potential for increasing efficiency by exploiting combined heat and power (CHP) systems that reuse heat produced by the power generation process. Recently, MIT Lincoln Laboratory staff collaborated with the Boston Redevelopment Authority (BRA) to complete the Boston Community Energy Study, a starting point for an investigation into a potential resilient power system design for Boston. An early step in determining feasible locations for microgrids is discovering the areas in which energy usage is highest. The goal at this stage is to identify an “anchor building” for a microgrid. The anchor building is one that demands enough energy to justify the investment in local infrastructure upgrades for establishing a microgrid. The areas in red above are the top 2% of Boston land parcels (about 500 parcels) in terms of total annual energy use. This figure shows a sample potential microgrid zone, with the anchor building situated in the center. Concentric rings, indicating high to lower energy usage by the shading from red to light green, emanate out from the center point at increments of 50 meters. The buildings that fall within the rings are considered for analysis as opportunities for utilizing CHP systems. 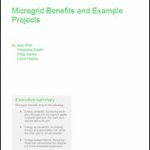 “There are myriad benefits that stem from integrating microgrids into Boston,” said Eric Morgan, a member of the Laboratory’s Energy Systems Group who utilized his previous experience with microgrid analysis in his role as technical lead of this energy study. “First, microgrids can decouple from the larger utility grid and operate autonomously, making them more resilient to large weather events. Second, when electricity generation and consumption are co-located, as with many microgrids, there is an opportunity to utilize the waste heat (i.e., the byproduct of energy generation) within neighboring buildings for hot water, heating, or even cooling.” A CHP system that makes use of waste heat produces two energy products from a single fuel source, effectively doubling fuel efficiency. While assessing new resilience strategies, the BRA identified a gap in the data on the energy usage of small buildings, and even some commercial buildings, in Boston. To address this deficit, the BRA asked the MIT Sustainable Design Lab (SDL) to generate a map of simulated energy usage for each building during every hour of the year. 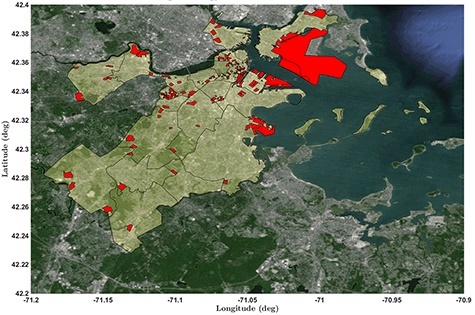 The SDL used datasets about building age and type, provided by the City of Boston, to produce thermal and electrical use estimates of 85,000 buildings. The resulting dataset from SDL was the first of its kind, including temporal resolution and data on the types of energy being used. “The SDL data was leveraged extensively for this study,” said Morgan. 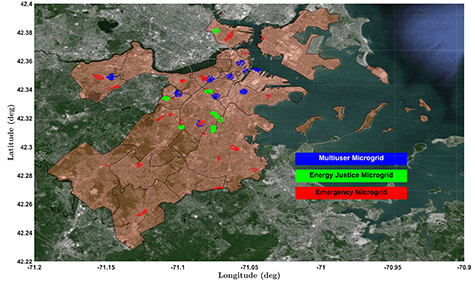 Ultimately, the team identified 22 potential microgrid sites, split between three distinct types: ten multiuser microgrids to deliver power to mixed-use buildings from an anchor building; ten energy justice microgrids to service affordable housing buildings; and two emergency microgrids to supply power to places that would provide food, warmth, and water during disaster events. Some of the sites are now being further investigated at a more granular level in order to better analyze where and how microgrids should be built out. Stephen Valentine and Victoria Dydek drew upon Morgan’s data analysis and location assessments to ascertain the technology needs (e.g., heating and cooling systems, control systems, computers), the financial costs, and the CO2 savings for each microgrid site. To develop these site assessments, Valentine and Dydek used the Distributed Energy Resources Customer Adoption Model (DER-CAM), a decision support tool for distributed energy systems. Designed by Lawrence Berkeley National Laboratory and adapted by Valentine for this specific case, DER-CAM uses three types of input data: energy usage statistics, economic constraints (e.g., energy pricing, site construction costs, operation and maintenance costs), and environmental factors (e.g., outside air temperature, solar effects) to recommend an optimal site selection and the dispatch of available energy-generation technologies. “DER-CAM is programmed to make site recommendations that minimize cost and/or greenhouse gas emissions,” said Valentine. As program manager for the study, Erik Limpaecher, assistant leader of the Energy Systems Group, connected Lincoln Laboratory with not only the BRA but also the agencies and people with a strong interest in Boston’s energy resilience. 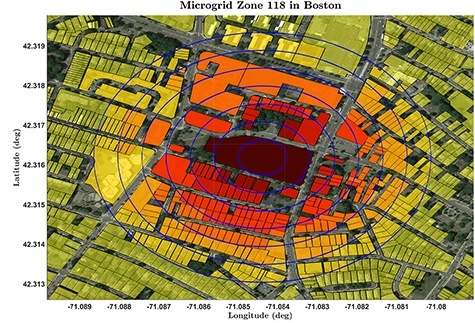 According to Morgan, “The study brought together many different stakeholders, including the City of Boston, the gas and electric utilities, policymakers, and the public, in order to foster energy infrastructure innovation within the region.” This first-ever city-scale study of microgrids estimated that the 22 potential microgrids could realize $1 billion in financial and environmental savings over the next two decades. That estimate is a definite encouragement for future investigations into microgrids, and not just in Boston. This article originally appeared on the MIT Lincoln Laboratory site and was reposted with permission. Boston Wants to Build Microgrids. But What about Utility Franchise Rights?